by Chris Woodford. Last updated: January 19, 2019. Hard, shiny, and tough—metals are the macho poster boys of the material world. Learning how to extract these substances from the Earth and turn them into all kinds of useful materials was one of the most important developments in human civilization, spawning tools, jewelry, engines, machines, and giant static constructions like bridges and skyscrapers. Having said that, "metal" is an almost impossibly broad term that takes in everything from lead (a super-heavy metal) and aluminum (a super-light one) to mercury (a metal that's normally a liquid) and sodium (a metal soft enough to cut like cheese that, fused with chlorine, you can sprinkle on your food—as salt!). What exactly are metals and what makes them so useful? Let's take a closer look! Photo: Metals like iron help bridges hold their proud heads high. The Golden Gate bridge, shown here, is made from 75 million kg of steel (an alloy of iron)... so why isn't it a cold, dull gray? It's painted to protect it from rusting in the salt-water air (in a warm, distinctive color known as International Orange). 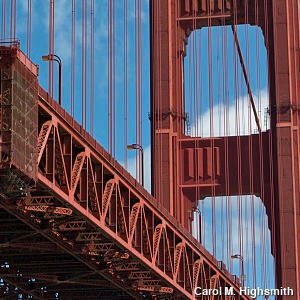 Detail of the Golden Gate Bridge by Carol M. Highsmith. Photo from the Jon B. Lovelace Collection of California Photographs in Carol M. Highsmith's America Project, Library of Congress, Prints and Photographs Division. You might think Earth is a big lump of rock, hard on the outside and soft in the middle—but quite a lot of it is actually metal. What exactly is metal? Over three quarters of the chemical elements that occur naturally on our planet are metals, so it's almost easier to say what metal isn't. When we talk about metals, we're usually referring to chemical elements that are solid (with relatively high melting points), hard, strong, durable, shiny, silvery gray in color, good conductors of electricity and heat, and easy to work into various different shapes and forms (such as thin sheets and wires). The word metal is quite a broad and vague term, and not something you can define precisely. Photo: An intermetallic compound (similar to an alloy) made from silver (a transition metal) and yttrium (a rare-Earth metal). Photo taken at Ames Laboratory courtesy of US Department of Energy. When we talk about nonmetals, it ought to mean everything else—although things are a bit more complex than that. Sometimes you'll hear people refer to semi-metals or metalloids, which are elements whose physical properties (whether they're hard and soft, how they carry electricity and heat) and chemical properties (how they behave when they meet other elements in chemical reactions) are somewhere in between those of metals and nonmetals. Semi-metals include such elements as silicon and germanium—semiconductors (materials that conduct electricity only under special conditions) used to make integrated circuits in computer chips and solar cells. Other semi-metals include arsenic, boron, and antimony (all of which have been used in the preparation—"doping"— of semiconductors). Artwork: The periodic table is dominated by metals. Over three quarters of the natural elements are metals of one kind or another. Take a look at the periodic table (the way we draw the elements in a chart so ones with similar physical and chemical properties line up together) and you'll see two types of metal get special treatment. 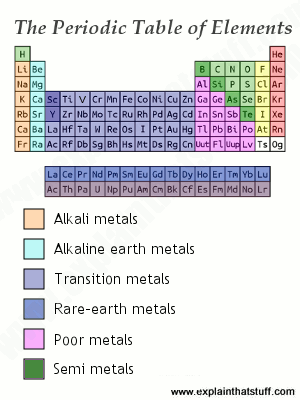 The middle of the table is dominated by a large group of elements called the transition metals (or transition elements); most of the familiar metals (including iron, copper, silver, and gold) live here, along with less well known metals such as zirconium, osmium, and tantalum. The other group, called the rare-earth metals, is often printed separately from the main periodic table and includes the fifteen elements from lanthanum to lutetium plus scandium and yttrium (which are chemically very similar). They're called "rare-earth" metals for the rather obvious reason that they were originally believed to exist in extremely scarce deposits in Earth, though some are now known to be relatively common. Like many conventional metals, the rare-earths don't occur naturally in their pure form, but only as metal oxides. When is a metal not a metal? Look at a car, plane, or motorcycle and you see lots of metal—or do you? Quite a lot of the metal-like materials around us are actually alloys: metals that have been mixed with other materials (metals or nonmetals) to make them stronger, harder, lighter, or superior in some other way. Steel is an alloy of iron, for example, that contains a small amount of carbon (different types of steel contain more or less carbon). Bronze is an alloy of copper and tin, while brass is the alloy you get when you mix copper and zinc. It's also very common to find plastics that have been electroplated (coated with a thin layer of a metal element, using electricity) to make them look like shiny metals. Plastics treated this way look shiny and attractive, like metals, but are usually cheaper, lighter, and rustproof—but also weaker and less durable. 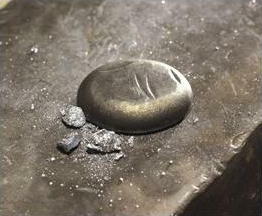 Photo: Metals are buried inside Earth, usually mixed in with useless rock. Extracting them is often difficult, dangerous, and expensive. Photo by Carol M. Highsmith courtesy of Gates Frontiers Fund Wyoming Collection within the Carol M. Highsmith Archive, Library of Congress, Prints and Photographs Division. Whether you're assembling airplanes or building batteries, you need metals—and lots of them. The snag is that metals generally don't occur in the ground in exactly the way that we'd like to find them, in their pure form and in deposits large enough to make it worth our while to extract them. Often they're buried in rock with deposits of other metals and they exist not as pure elements but oxides (metals fused with oxygen atoms) and other compounds. 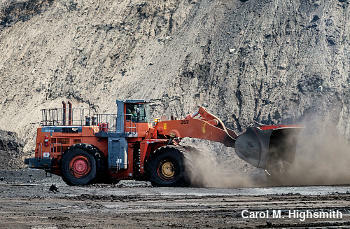 Producing large quantities of a metal like iron, aluminum, or copper therefore involves two distinct operations: extracting an ore (a deposit consisting usually of a huge amount of useless rock and smaller amounts of useful metals) from a mine or quarry and then refining the ore to get the metals away from their oxides (or other compounds) into the pure form that we need. Exactly how this is done varies from metal to metal and from place to place, but usually involves a mixture of mechanical processing (such as grinding, filtering, or using water to wash away unwanted materials), chemical treatment (using acids, perhaps), heating (smelting iron ore, for example, involves roasting it in air to remove the impurities), and electrical treatment (such as electrolysis—separating a chemical solution into its constituent elements by passing an electric current through it). With so many chemical elements classified as metals, you might think it would be difficult to generalize about them. But that problem is true of pretty much any generalization: every house is different, but we can still say that houses tend to have doors, walls, windows, and a roof and provide shelter from the weather—and we can all sketch one on paper. Photo: Metal objects that are repeatedly stressed and strained (pulled, pushed, bent, twisted, or otherwise subject to forces) will undergo fatigue and then suddenly fracture. Here's a teaspoon that I bent one time too many showing (left) a closeup of the fracture and (right) the broken spoon for context. They are mostly solid (at everyday temperatures), crystalline (their atoms are stacked up in orderly patterns like cans in a supermarket), hard, strong, and dense (most metals will sink if you drop them in water, for example). Metals are malleable (relatively easy to work into new shapes and forms) and ductile (with the right equipment, you can tease them out into long, thin wires). Even so, they don't wear out quickly or break easily, though they can and do fracture (crack or snap) eventually through repeated stresses and strains because of metal fatigue (a gradually developing weakness). Most metals are opaque (unless extremely thin) and shiny and silvery gray in color (because they tend to reflect all wavelengths of light to the same extent). Some metals are colored (because they reflect certain light wavelengths better than others); the best-known examples are probably gold (a yellowish color) and copper (normally reddish, though it turns blue after exposure to air converts it into copper oxide). Most metals conduct electricity well (they have a low electrical resistance, in other words) and feel instantly cold to the touch (because they conduct heat well too, carrying heat energy quickly away from your body). Metallic elements such as iron, nickel, cobalt, and neodymium (and alloys based on them) power the best magnets; most other metals make such poor magnets that they're usually thought of as non-magnetic. Why are metals such good conductors of heat and electricity? The simplest explanation is to think of the atoms in a metal as ions (positively charged nuclei) surrounded by a sort of sea of free electrons that wash readily through the entire structure, carrying heat or electrical energy as they go. Remember that opposites attract, in electricity as well as magnetism, so the static-electric pull between the positively charged ions and the negatively charged electrons makes for a tightly bonded structure that is strong and hard. The atoms can still move past one another (with difficulty) and that's why metals are relatively easy to work and shape. Animation: Metals conduct electricity because they have "free" electrons (blue) that are not fixed to any particular atom (black). The electrons can move through the whole metal carrying electrical energy from one end to the other. What is the band theory? Metallurgists (scientists who study metals) prefer to explain the properties of metals using a more complex idea called the band theory. You've probably learned in school that the electrons in a single, isolated atom are arranged in energy levels (sometimes referred to as shells, sometimes as orbitals—different ideas but they're broadly talking about the same thing). In a solid, there are lots of atoms sitting next to one another, but they don't behave as isolated units. Instead, their electron orbitals overlap, forming what are called bands that extend between atoms (they're molecular orbitals, in other words), and spread across the entire solid. In metals (conductors), the two bands overlap, so when energy (in the form of heat or electricity) is added to the material, electrons are readily promoted from the valence band to the conduction band and carried through the material, giving rise to an electric current or heat conduction. In nonmetals (insulators), there is a large "band gap" between the valence and the conduction band; in other words, it takes a great deal of energy to get an electron from one band to the other. Under normal circumstances, electrons don't get promoted from the valence band to the conduction band and the material doesn't conduct electricity or heat. On this theory, semi-metals (such as semiconductors) are midway between metals and nonmetals: they're effectively insulators with a much lower band gap than normal nonmetals. Metals react easily with other elements, their atoms giving up electrons to form positive ions and compounds known as salts. The "salt" you might sprinkle on your dinner is a typical example (it's the compound that forms when sodium metal reacts with chlorine gas), but it's only one of hundreds of different salts. The general willingness of metals to react with other elements is the main reason why they're often so difficult to extract from ores: they react so readily with oxygen in the air (or sulfur in the ground) that they're more likely to exist as oxides (or sulfides) than in their pure form. We also have a more general introduction to materials science. ASM International: The world's largest society for metallurgists and engineers who work with metals. The Minerals, Metals, and Materials Society: A US-based materials organization with international membership and events all across the world. The New Science of Strong Materials (or Why You Don't Fall Through the Floor) by J.E. Gordon. Penguin (various editions). This classic, very readable book explains how and why materials such as wood and metals behave as they do. Part III, The Metallic Tradition (Chapters 9–11), covers metals. Stuff Matters by Mark Miodownik. Penguin, 2013. A great, non-technical introduction to materials science. 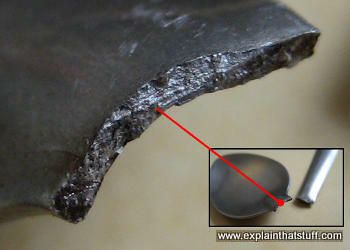 Chapter 1, Indomitable, covers steel, while Chapter 10, Immortal, looks at titanium and alloys. Metalworking—Doing it Better: Machining, Welding, Fabricating by Tom Lipton. Industrial Press, 2013; and and Metalworking Sink Or Swim: Tips and Tricks for Machinists, Welders, and Fabricators by Tom Lipton. Industrial Press, 2009. Practical guides to metalworking techniques aimed at the hobbyist. Physical Metallurgy by Robert Cahn and Peter Haasen. Elsevier, 1996. Classic undergraduate textbook in print since the 1960s. Science: A Children's Encyclopedia by Chris Woodford and Steve Parker. DK, 2018/2014. Written by Steve Parker, and me, this is a more general introduction, with matter and materials covered in detail in the first two sections. Ages 8–10. Metal by Abby Colich. Raintree, 2014. A very simple 24-page introduction for ages 4–6. Part of a series titled "Exploring Materials." Metals by Chris Oxlade. Heinemann, 2007. A basic 48-page overview for readers aged 9–12. Metals by Carol Baldwin. Heinemann/Raintree, 2005. A similar 48-page book for the same audience (ages 9–12). A short sheet metal history: Metalworking World Magazine. June 9, 2014. How and why sheet metal has become so important over the last few hundred years. Metalworking throughout history by Professor R. Carlisle "Carl" Smith. The Fabricator, May 5, 2014. A whistle-stop tour of metal welding, from ancient times to modern. Basic Metallurgy For the Smith: A 10-minute introduction to metals and metalworking from Trenton Tye and Purgatory Iron Works. An easy-to-follow, beginner's introduction geared to blacksmiths, with an emphasis on wrought iron, structural steel, and carbon steels.